I had intended to get this site launched over the Christmas and New Year break but… well, something about having toddler twin boys and a pregnant wife changed those plans. The CSV files allow you to import or subscribe to details of the Scottish Episcopal Church saints’ days, festivals and readings in your Outlook or Google calendar. I also recently started adding an iCalendar feed, which enables you to subscribe to the calendar. The idea there is that if any of the details change then they get updated automatically. I created the first file in 2005, for my own use both in Outlook and on my Psion PDA, I mentioned it to a few folks who were interested in it and have made it available on my blog ever since. But I felt that it deserved more than just a blog page, so I created this new website for it. The homepage of the new website (www.garethjmsaunders.co.uk/secoutlook) updates every day to show you what today is in the liturgical calendar. It changes colour too to reflect the current feast day: gold, green, red or violet. The Outlook 2010 page also includes screencast videos, recorded using the excellent Camtasia Studio. The archive has links to every file that I’ve created. Well, not every file… just the files to do with this. Calendar and Lectionary 2010-2011 now available to download. A list of all saints days throughout the year. Readings for Sundays, weekdays, festivals (saints’ days) and special occasions (both Eucharists and daily prayer). Each year the Church produces a guide to the calendar and lectionary which keeps mortals like you and me correct. The Sunday readings are on a 3 year cycle (next year is Year A), while the daily prayer readings and daily Eucharists are on a 2 year cycle (next year is Year 1). Once you add in saints’ days, and start translating saints days to adjacent days because they clash with feast days of a higher order, it all begins to get a bit complicated. For the last few weeks I’ve been preparing the files, sitting for hours in front of my computer typing in line after line of readings. Most years I do it in a bit of a last-minute panic and end up creating a bespoke file specifically for that year, but this year I wanted to be organised and produce something that can be used year after year. plus a comprehensive master list of saints’ days, which should in future enable me to compile the files in just a few days rather than 4-8 weeks as it does at the moment. I’ve just finished entering all the readings for the entire church year—from the first Sunday of Advent to the Week of Proper 34 (Christ the King)—and tomorrow morning will start on the readings for festivals, common saints’ days and special occasions. Then I’ll be ready to compile everything for this year. For once I may even be done by the start of the church year (which is this coming Sunday, the first Sunday of Advent). You say single point-of-failure, I say synchronized data! Back in July 2009 I upgraded my mobile phone from an O2 Xda Orbit to an O2 Xda Zest. All was well until I tried to synchronize it with two copies of Microsoft Outlook, one at home, the other at work. A quick Web search showed me that I wasn’t alone. It turns out that there was a bug in that version of Windows Mobile 6.1 on my phone. Microsoft had fixed it and rolled out the update to OEMs but it appears that O2 wasn’t going to let it roll any further. So I was stuck with a phone that would synchronize with only one PC. Which was somewhat bothersome as I was rather used to the convenience of my calendar, contacts, tasks and notes being available both at work and at home, as well as on the go on my mobile phone. I needed to find another solution. The first thing I looked for was an alternative to Microsoft ActiveSync (I was using Windows XP at the time) and I discovered XTND Connect. I wondered if the problem could be bypassed by using an alternative to ActiveSync. That didn’t work either, which made it quite an expensive mistake. The demo version looked promising but was so highly crippled in terms of functionality that I had to buy the full version in order to fully evaluate it. Which rather defeats the purpose of a demo version, in my view. I explored the Google Calendar and Google Contacts option but (and for me, it’s a deal-breaker, which is one reason I’ve not gone rushing out to buy an Apple iPhone) one the elements of Outlook that I use perhaps more than any other is Tasks. And I couldn’t sync my tasks with Google Calendar. I assumed that Exchange would be out of my price bracket so focussed on the second option which led me to Sync2 from 4Team. Not only does Sync2 synchronize your Outlook calendar, contacts, tasks and notes with a folder of your choosing (USB flash drive, local folder, LAN folder, etc.) it will also synchronize with Google Calendar and Contacts. 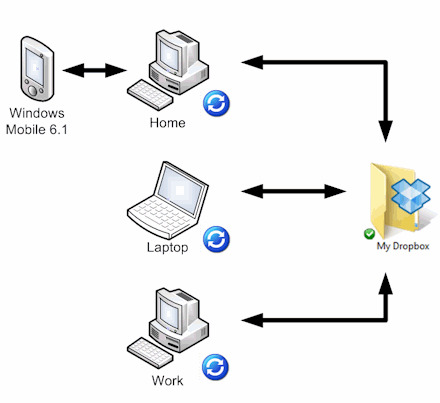 I discovered that if I synchronized it with a folder in Dropbox at home I could then synchronize it again from the same folder on my PC at work, without having to worry about remembering to pack my USB flash drive. That has been the solution I have been using for the last six months to synchronize my data between home, work and my laptop. Resynchronize a profile (i.e. make it think it was doing it for the first time again. Delete a profile and recreate it from scratch. But most of the time it worked pretty well. Except that it still didn’t address the issue of my mobile phone being out-of-sync for most of the day, between synchronizations at home. 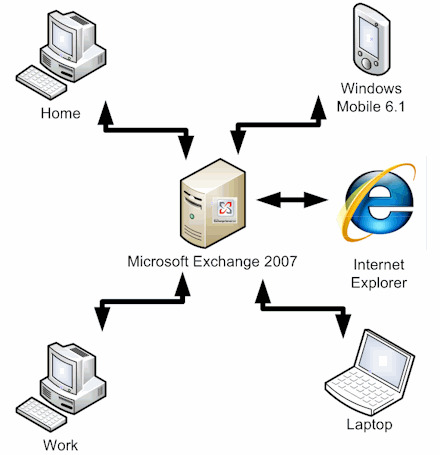 So in January I went in search of an affordable, UK-based hosted Microsoft Exchange account. 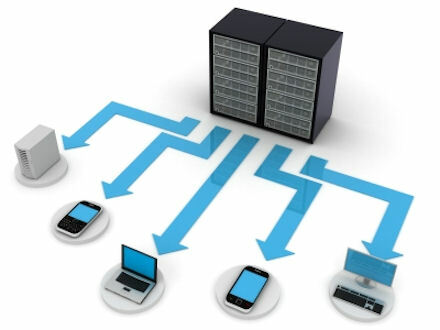 With each device connecting directly to the Exchange server I can guarantee that my data is always up-to-date (server outages withstanding). Another welcome benefit is that I won’t have the problems of duplicated entries that I’ve experienced so many times when synchronizing multiple devices. Here’s a screenshot I took of Outlook and posted to Twitpic last month showing a repeated entry for “Doug Aitken’s Birthday” duplicated 13 times! I can even resynchronize my mobile phone when I’m out and about using my roaming Web add-on from O2. So far I’m really pleased with Exchange and with the service offered by Simply Mail Solutions (SMS). I’ve noticed only one outage from Simply Mail Solutions which lasted only a couple of minutes when connection to the server went down, and one period of particularly slow connectivity … but then it was 01:00 in the morning, they were doing some maintenance on the servers (I discovered via a quick support call) and I should have been in my bed! the potential for it to be a single point of failure: if it goes down completely I can’t synchronize between locations and my data isn’t up-to-date. But given my previous experience of hours and hours wasted by repeatedly cleaning up corrupted or deleted data through failed synchronizations, and living with the uncertainty that perhaps my work calendar isn’t exactly the same as my home, laptop or mobile phone calendars … I think I’ll stick with Exchange for a while. I got an email this week from Calgoo announcing that their calendar sync and share products are now free, as of 22 July 2008. Over the past two years, Calgoo Software has been developing the most complete calendar suite on the market. We released a full-featured desktop calendar program, the only Google Calendar sync solution that works with both iCal & Outlook, as well the world’s first cross platform calendar sharing service. We are also working behind the scenes on our new in-calendar advertising models and are close to releasing these. I’ve used Calgoo Connect in the past to sync Outlook with Google Calendar, and I was impressed. Tungle is a free, effective and simple meeting coordinator. View the availability of friends, colleagues or business associates before sending them a meeting invitation. Create Tungle Spaces – temporary web sites for coordinating meetings with anyone, including people who don’t have Tungle. Get started in seconds, using your existing calendar (e.g. Outlook, Lotus Notes and Google Calendar) across firewalls and organizations. What I find really attractive about Tungle is that you can use your existing calendar. At work we use Meeting Maker to organize meetings but it doesn’t connect to your existing calendar application (it does with an expensive plugin!). Not that I’m a Mac user, but there doesn’t appear to be support for iCalendar, which seems a shame/short sighted. I wish I had an excuse to play around with Tungle now.